“Being at Ramapo College has been a joyous journey, given the amazingly supportive and unselfish colleagues who want you to succeed in every endeavor. This has made it incredibly easy to be there for students from every perspective and to provide them with well-designed, relevant and applicable knowledge on a daily basis. It has only been three years since I joined Ramapo and already I have had the opportunity to develop new courses, and have been provided grant funds to support undergraduate research, start new student chapters to promote leadership and management across campus, and engage in several in-house and international conferences. – Malavika Sundararajan is an Assistant Professor of Management and first joined Ramapo in 2014. 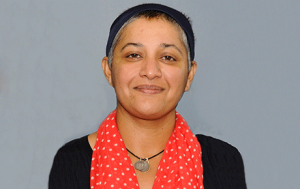 For more information, please visit Malavika’s Faculty Page. Sundararajan, B. and Sundararajan, M. (2013) Like us on Facebook and Follow Us on Twitter: Corporate Identity Management Across Social Media Platforms, Book Chapter in Social Networking and Identity Management, Lexington Books.